French first division side Paris St Germain have signed Benin midfielder Stephane Sessegnon from rivals Le Mans. Sessegnon, who scored five times in 30 league appearances for Le Mans last season, signed a four-year contract. "Stephane Sessegnon, after having passed his medical, committed himself to PSG this afternoon for four seasons," a club statement said. The 24-year-old is part of the Benin squad currently bidding to qualify for the 2010 World Cup finals in South Africa. 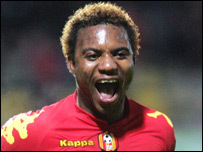 Sessegnon becomes the latest player to head for the Stade Leon-Bollee exit doors after Ivorian Romaric left last month.